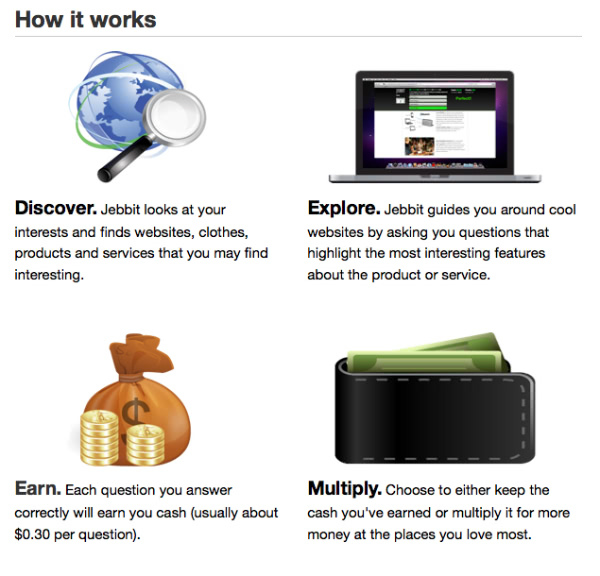 Jebbit is the type of startup I wish was around when I was in college. You see, the site finds out your interests, guides you around cool sites and products accordingly, asks you questions about said products and sites and pays you for your answers. Easiest college gig I’ve ever heard of! I was stuck making no-fat mocha fraps at Starbucks. Oh well, I’m a prominent tech journalist now, so everything works out in the end. We did manage to catch up with Jebbit COO Jonathan Lacoste to talk starting up in college, 5-year visions and defining success. How’d you come up with the name Jebbit? The founder of Jebbit, Tom Coburn, originally started it as part of the Boston College Venture Competition with his roommate Jeb. As COO, Tom (CEO) and I sit down every night and create a list of what needs to get down tomorrow, within the next week, and within the next couple of weeks. First thing every morning, I attack whatever requires the most brain power and normally try to save the emails for later in the afternoon. 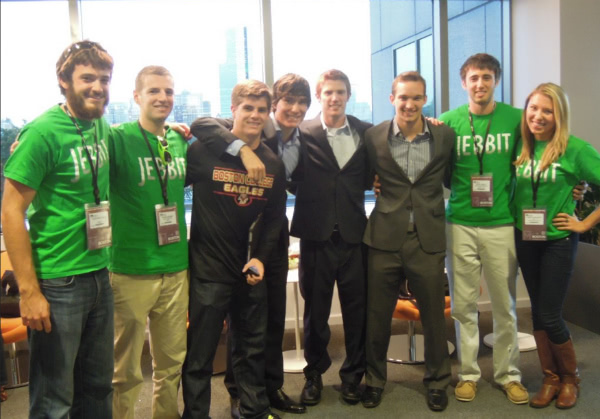 Jebbit started with Tom Coburn and 3 others simply as part of the business plan competition at Boston College. 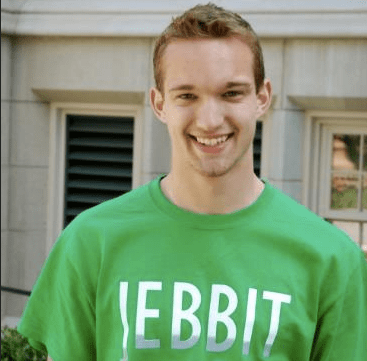 Once the competition was over and Jebbit had won, Tom wanted to continue to pursue Jebbit and turn it into a business while the others weren’t as interested. Shortly afterwards, Chase McAleese (CPO) and myself (COO) joined Tom and form the Management Team. Our entire team consists of 35 undergraduate students from Boston College, Harvard, and MIT. As an online advertising startup, one of our main goals is to always have a large number of clients. When we first started, we hadn’t exactly figured out what type of company our solutions best worked for so I remember one of the first things we did was spent weeks going door to door in downtown Boston trying to sell on the spot to local restaurants and vendor shops. Needless to say, it was quite the learning experience and we quickly switched our focus. Life as an entrepreneur can be frustrating quite frequently and learning how to handle it is extremely important. I’ve committed myself to finding that one activity that is not related to my startup that I can always go back to when times are tough. For me, that’s running. For others on our team, its other activities. I also wouldn’t be honest if I didn’t say there was at least one frustrating moment each day. It’s not because things aren’t going well, but I believe that you’re not pushing yourself hard enough if you don’t get frustrated at least once in awhile. It really depends on the what team is working. Music is typically played more with the marketing, sales, and user experience teams. We encourage collaboration between members of these teams, especially our different marketing groups, because it results in the best ideas. Our tech team normally prefers a quieter work environment, as does the management team. While we all love working on Jebbit, we don’t envision Jebbit to be a lifestyle business. We envision Jebbit to have been sold or bought out within the next five years if that’s the route we end up deciding to take. The biggest distinctions for us as a company right now are that in five years, we’d like to be focused on more than just one market (currently the college demographic) with more than one platform (currently www.jebbit.com with many more technological developments on the way). We have big visions for Jebbit moving forward and so those of us that came before us that were transformative in their times and in their markets inspire us to do the same. The Steve Jobs, Bill Gates, Mark Zuckerburgs of the world. But we’ve also been impressed and inspired simply by the great team we’ve formed around us. We initially participated in the Boston College Venture Competition and the Summer@Highland Program (part of Highland Capital in Boston) and both of those programs gave us $21,500 in initial funding. Luckily we’ve been profitable since day 1 so we haven’t need funding as quickly as some other tech startups. We did recently raise $250,000 of seed investment from some prominent Boston investors, notably John Simon (General Catalyst Co-Founder), Dharmesh Shah (HubSpot Co-Founder), and Boston Seed Capital. Talk to as many people as possible. I’ve learned more from all of the free networking events in the city and asking people to coffee than any paid workshop or consulting company could offer. Don’t be afraid to get out there, ask questions, and talk about your startup. But tip: be prepared to give your own advice to, and be genuinely interested in other entrepreneurs’ startups. Some of my most important passions are philanthropy, education, and travel so I would have to say that I would travel (possibly Sub-Sahara Africa or Southeast Asia) and start a non-profit focused on helping children in poverty have access to better education. I am always hesitant to say that as an entrepreneur I am successful because I think it shows complacency and gives you a false sense of comfort. As a real entrepreneur, you need to always be pushing the envelope to make yourself and your company better, more efficient, etc. Am I proud of what our team has been able to accomplish to date? Of course. We’ve started a multi-million dollar tech startup in a cut-throat market (online advertising) all while still in school. But I think moving forward, the key to a truly successful entrepreneur is always moving the benchmark as to what you consider to be “successful,” and not allowing yourself to become complacent once you’ve reached some of your goals. For the Jebbit team, I don’t think we’ll ever quite feel that satisfaction of being successful enough because that’s not who we are. I think we’ll continue to innovate and improve our company as long as online advertising dollars are being wasted (one of the core missions of our company). It sounds cliche, but Twitter. I was kind of late to join the Twitter bandwagon, I created my profile less than a year ago. But what that platform has been able to do for me in terms of aggregated the most important startup, business, and entrepreneurial tips across the globe is still something I marvel at today. The 20 minutes I spend on Twitter a day learning from what world-class entrepreneurs are posting about is better spent than an hour long university lecture, in my opinion. What’s the greatest thing about Jebbit? As one of our clients told us, “it’s a win for everyone involved.” We feel that it’s best for the online advertiser, the online consumer/casual browser, and ourselves. One of my New Year’s resolutions was to start a blog, so be on the look out for that. But I do most of my thought sharing via Twitter.